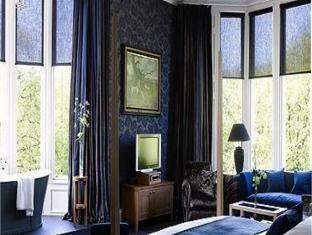 Set in a tree-lined Victorian terrace in the fashionable West End of Glasgow and only 30 minutes from the Loch Lomond, Hotel du Vin Glasgow at One Devonshire Gardens is a luxury boutique hotel - Hotel du Vin with that little bit more. This five star hotel has an enviable reputation for service and style, with 49 stunning bedrooms and suites, bistro, bar, cigar shack and whisky room, there is only One Devonshire Gardens for escapes, weddings, golf and field sports. Housed within this impressive building are 49 timelessly styled bedrooms and stunning suites, all featuring luxurious handsprung mattresses, fine Egyptian linen, deep baths and powerful drench showers, plasma TVs, DVDs and air conditioning. Hush Heath is a Townhouse Suite. A one bedroom suite with King size sleigh bed and separate lounge. Deep marble surround bath, walk-in monsoon shower and aqua tv screen. 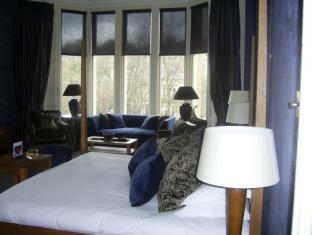 Suitable for families (sofa bed in lounge) and access to the Secret Garden at rear of hotel. Complimentary Jo Malone toiletries. 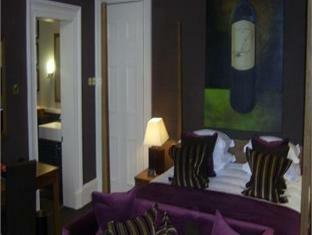 Balfour is a Luxury Town House Suite with a King-size four poster bedroom and separate living room with dining area. A large bathroom with marble surround Jacuzzi bath, aqua TV, large walk-in monsoon power shower and sauna. 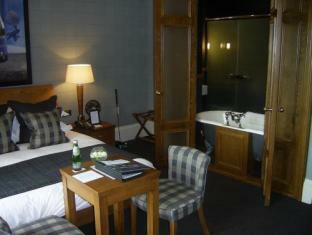 Plus a separate shower-room and private gym area. 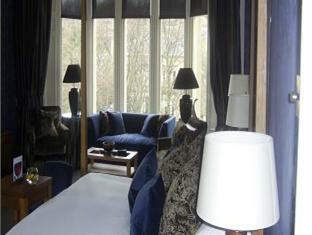 This suite also overlooks the Secret Garden. Toques & Clochers is our other Townhouse Suite a with King size four poster bed, huge separate lounge, with a dining table at the window. Shower room ensuite to the bedroom with a walk-in monsoon power shower. The bathroom is home to a deep marble surround bath and walk-in monsoon shower. 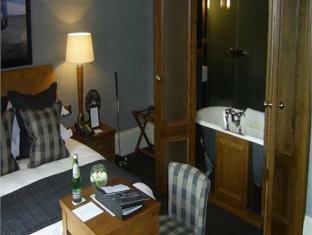 Toques & Clochers is also suitable for families with two pulldown single beds in the lounge. Vettriano Suite is a large open plan Grand Duplex Suite housing a King size bedroom featuring a free-standing roll top bath and Jack Vettriano prints. On the lower level is the bathroom complete with walk-in twin monsoon power showers. Chateau de la Roulerie is also a Grand Duplex Suite. With a large open plan King size bedroom featuring free standing roll top bath and like Vettriano Suite also has a bathroom on lower level with walk-in twin monsoon showers. Domaine Georges Vernay is our stunning Conservatory Duplex Suite. With a King size bedroom and conservatory lounge area which leads to a private patio area overlooking the hotel's terraced garden and a bathroom on lower level complete with a cast iron roll top bath and walk-in twin monsoon power showers. Breathtaking, bespoke meeting and events spaces to inspire, to think, to bring great purpose, but most of all be memorable. 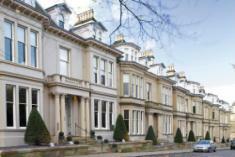 Hotel du Vin & Bistro Glasgow at One Devonshire Gardens is offering you just that. Set in a tree-lined Victorian terrace in the fashionable West End One Devonshire Gardens has four truly unique meeting and events spaces; Glenlivet, Ardbeg, Macallan & Glengoyne, all complete with high speed complimentary Wi-Fi, LCD projectors and a dedicated events organiser. 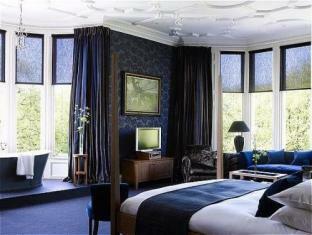 The largest of our rooms is Glenlivet which can accommodate up to 50 people. With 2 large bay windows and benefitting from an abundance of natural daylight is bursting with many of its original features. Ardbeg is a smaller room that can accommodate up to 18 people, like the Glenlivet it benefits from an abundance of natural daylight is bursting with many of its original features. The Ardbeg & Glenlivet can be combined to create a space that can accommodate up to 80 people. The Glengoyne is the smallest of our spaces accommodating up to 10 people with its own distinct in style and with many original and unique features. For a more informal setting, choose the Macallan, with its large comfy chairs is perfect as a breakout area during the day or for a cocktail event in the evening. Our beautiful Secret Garden is located in the centre of the hotel and is great for informal interviews or lunch meetings. Includes room hire, 3 servings of tea/coffee with homemade lights bites, chefs hot and cold buffet lunch with fruit juice, still and sparkling mineral water, LCD projector, screen and flipchart. Includes all the above with a three course dinner menu, one nights stay in a double room for single occupancy and full Scottish breakfast. Terms and conditions: Subject to availability.